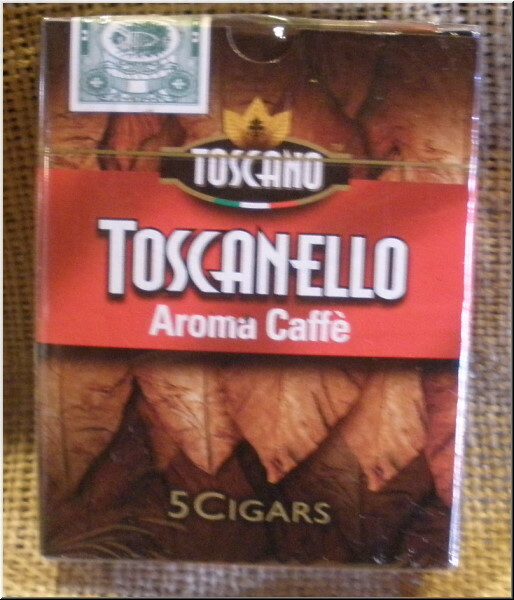 Toscanello Blu Anice (also called Toscanello Aroma Anice) is considered the "pioneer" of Toscanello Aroma cigars. It is created by mixing a blend of fermented Italian Kentucky from Campania, South American Kentucky and Far East Kentucky, then skillfully infused with a premium blend of anise and citrus extracts. 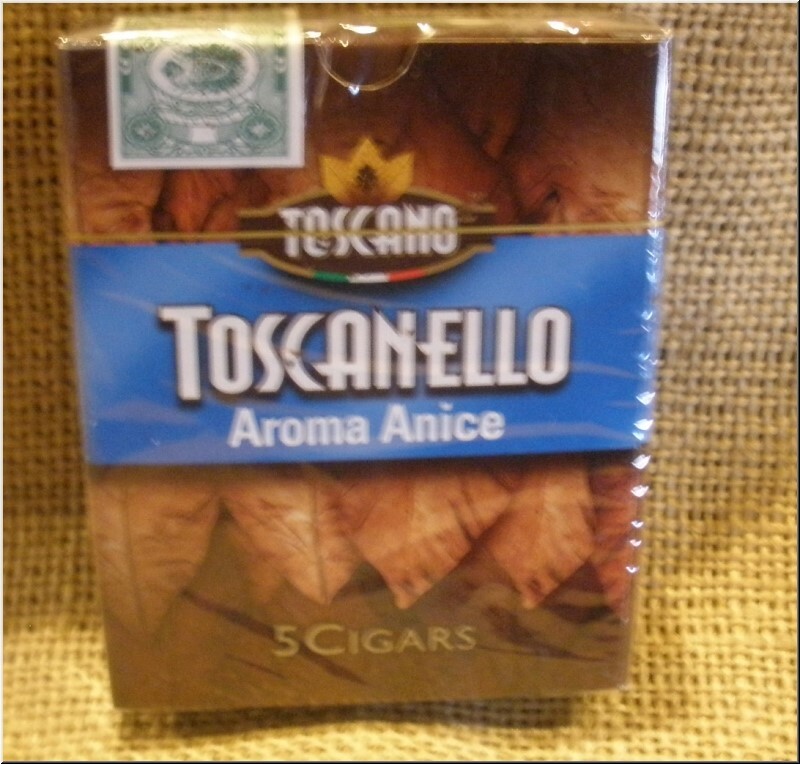 Imbued with a soft, pleasant aroma, Toscanello Anice is noteworthy for its refreshing taste and smooth smoke. This little cigar contains aromas of licorice and mint, thus making it a clean satisfying smoke after a heavy meal. It also makes an excellent choice for a beginner cigar smoker, or for an experienced smoker who enjoys an occasional mild cigar. Toscanello Caffe represents the perfect mix of Italian flavors: the strong aroma of espresso and the fragrance of fermented Italian tobacco from Campania. The filler is a blend of Italian, South American and Far East Kentucky tobacco infused with coffee extract. This is a refined cigar for those with the palate to appreciate two of life's finest pleasures. Born of an evolution of the traditional flavor of Toscano cigars, and created with carefully selected Kentucky tobacco, this small cigar appeals to a diverse audience who wants to break the rhythm of the day. The taste is soft and velvety, with pleasant notes of almond, vanilla and licorice. (Chocolate) Who could resist seduction? Especially when it is a blend of warm, dark chocolate flavor with the smoky aroma of fire-cured Kentucky tobacco. The taste of Toscanello Fondente (Cioccolato) is a swirl of smooth, rich hot chocolate and a special blend of Kentucky tobacco grown in Italy, South America and the Far East. 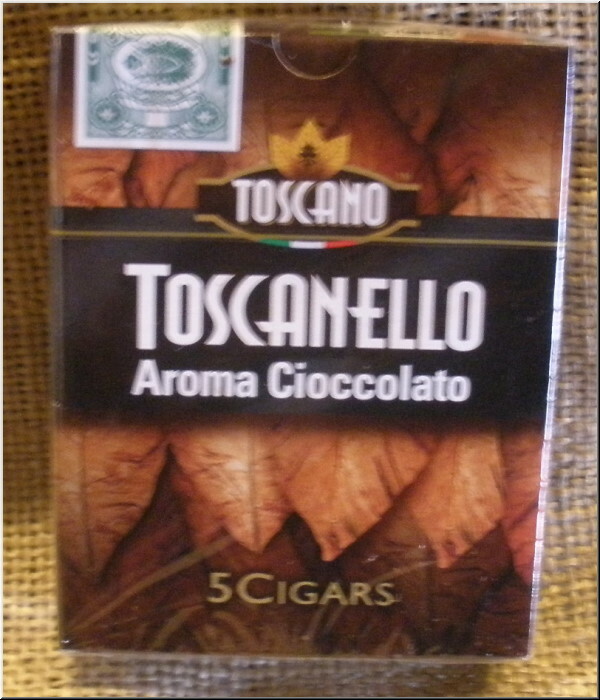 One of the most popular Toscanello cigars, Toscanello Fondente (Cioccolato) is a favorite among young and female smokers who are new to Toscano cigars, and seasoned smokers who enjoy new aromatic sensations. This sweet cigar is the ideal dessert after a sumptuous meal. 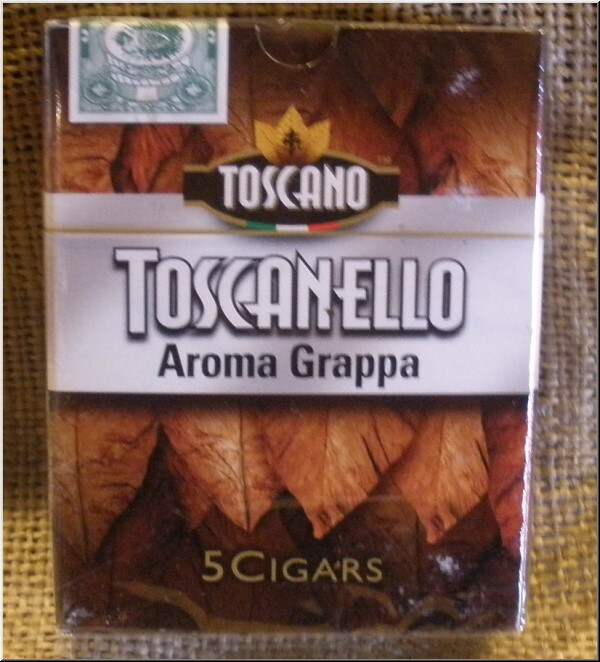 Toscanello Grappa is an innovation in the world of flavored Toscano cigars, which highlights the best blend of Kentucky tobacco flavor and the alluring flavor of the Italian national liquor. The aroma is heady and deep, with floral and licorice notes that complement the distinctive grappa. The base of Toscanello Grappa begins with the selection of high quality Kentucky tobacco, and it is then slowly cured to capture the best blend of tobacco flavor and the distilled grappa. It is the perfect aperitif and a great complement to any drink or meal. This cigar is particularly favored by the trendy smokers who sought after an original, refined taste. Smoking a Toscanello relives the charm and nostalgia of post-World War II Italy. 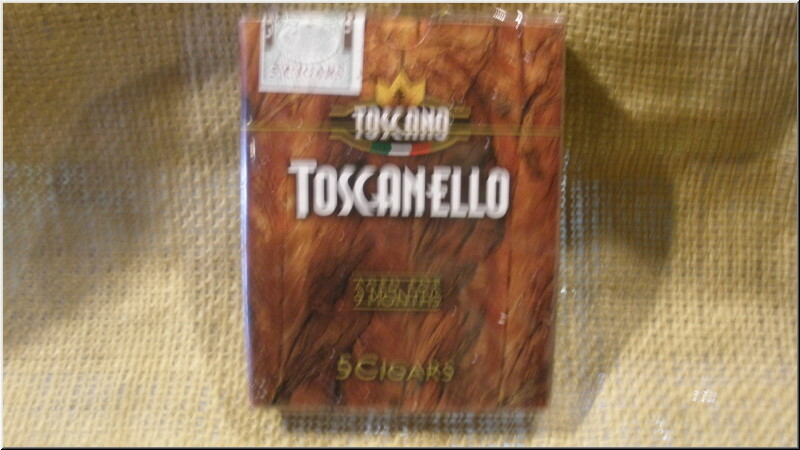 Toscanello was created to be a more affordable option to the Italian people�s favorite Toscano cigars. It quickly became the new fashion to enjoy a smoke with a friend, thus earning its nickname of the "Friendship Cigar". 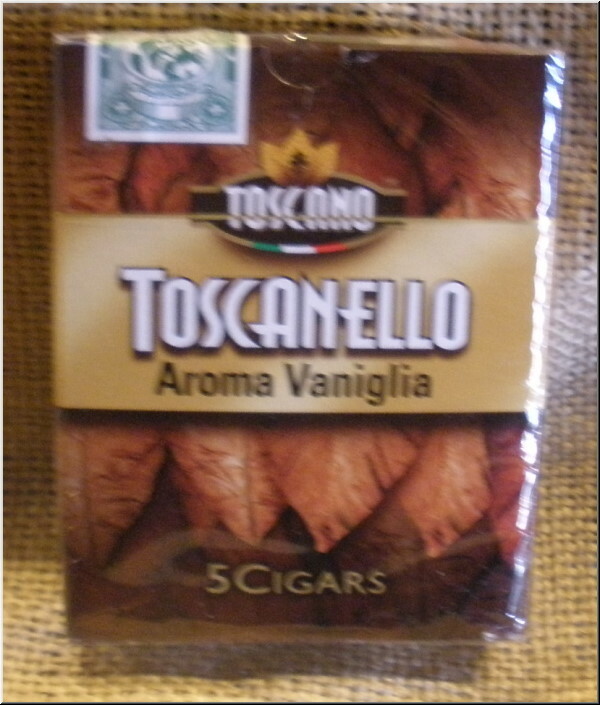 (Vanilla) Launched as a limited edition in 2009, Toscanello Vaniglia was an instant success with consumers. It was later reintroduced in 2012 and has became one of the most popular members of the Toscanello Aroma family. The smooth, buttery and smoky notes make Toscanello Vaniglia amiable for any moment of the day. It is made with carefully selected blend of Kentucky tobacco from different regions, which is infused with vanilla essence. This pleasantly fragrant and irresistible little cigar is the answer to those who seek a soothing aroma to relax.